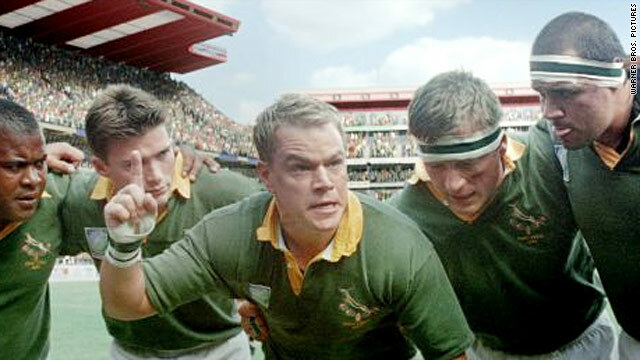 Matt Damon sports some impressive abs and a false nose in "Invictus"
(CNN) -- As another Oscar season kicks into gear, Clint Eastwood returns with his annual contribution to Hollywood's self-esteem, in this case a solidly uplifting historical drama about President Nelson Mandela and South Africa's bid to win the Rugby World Cup in 1995. Based on John Carlin's nonfiction book, "Invictus" follows in the tradition of blazed by screenwriter Peter Morgan in "The Last King of Scotland," "The Queen" and "Frost/Nixon." All these films bask in the personal charisma of a political leader while interrogating, to some extent, his or her attempts to harness the will of the people. Curiously, while "Invictus" is credited to screenwriter Anthony Peckham, Eastwood has teamed up with Morgan for his next project. Of course Nelson Mandela is no Richard Nixon, let alone an Idi Amin, and the film sometimes borders on hagiography. Apparently Mandela suggested Morgan Freeman for the role himself, which is a bit like hand-picking the Almighty, but nevertheless feels appropriate. Freeman only gestures towards Mandela's distinctive voice and speech pattern, but has the familiar dignity and flirtatious charm down pat: he makes it his business to know everyone on his staff by name and ask after their family -- especially the ladies. When he assumes the presidency in 1994 after the first post-apartheid elections, Mandela is faced with innumerable problems, not least nearly 40 million citizens living in terrible poverty, many of them deprived of education, health care and basic sanitation. Ministers and colleagues in the African National Congress are mystified when he breaks from his schedule and intercedes to overturn an order to abolish the Springboks, the rugby team that was hated in the townships as a symbol of the Afrikaans' regime. Eastwood illustrates the problem very adroitly in the film's first shot: a slow pan from white kids playing rugger in a smartly appointed school field to sparsely dressed black children kicking a soccer ball across a patch of wasteland on the other side of the road. When Mandela and his entourage drive down between them, the black kids wave and cheer while the whites stand and watch in apprehensive silence. Mandela realizes that axing the 'Boks will only alienate the Afrikaans and fuel their fear. But he also sees opportunity. South Africa is due to host the Rugby World Cup in 1995. If they were to win it, the tournament might unite his new "Rainbow Nation." The trouble is, after years of international isolation they're rank outsiders even in their own eyes. "Here is the problem: how to inspire people to be better than they think they are?" he says, or words to that effect, over afternoon tea with the frankly overawed team captain Francois Pienaar (Matt Damon sporting impressive abs and a false nose). At first Pienaar only dimly appreciates what his President is up to; he's offering himself as a talisman for the team. Eastwood cast a rather more cynical eye over national morale-building in the homegrown "Flags of our Fathers." Uniting the blacks behind a team with only one coloured player might be considered a skin-deep accomplishment, but "Invictus" makes the political calculation clear: South Africa needs to keep its white population if it's to function as a society. And it reminds us that in such dire circumstances, reconciliation is no mean feat. Laconic as an actor, Eastwood the director has a tendency to underline and italicize his messages. "Invictus" could have been significantly shorter than 134 minutes and stronger for it. It could also have been improved with a less maudlin score than the gloop credited to Michael Stevens and Kyle Eastwood. As a sports film, it's functional. But whatever its shortcomings, the movie has substance and conviction. At its heart is Mandela, a man who appreciates the value of symbols, and who continues to symbolize something very precious to the world.